Cleverbot - an open-source AI project aimed at improving responses to everyday questions, from the silly to the philosophical. Facebook Messenger - Facebook’s instant messaging service has proven to be one of the most popular platforms for chatbot services. Google Assistant - a personalised assistant, within your phone, powered by Google. Combining the intelligence of machine learning and AI systems with the personal touch of technology platforms such as instant messaging apps or mobile devices, chatbots could soon be the best way for businesses to directly reach out to their individual customers. Until recently the dream of science-fiction writers, chatbots have now enjoyed a surge in popularity in recent months as businesses around the world seek a way to directly interact with customers through the apps and services they use the most. Whether this is through instant messaging services, personal assistants such as Siri or Cortana, or customised online agents to walk them through purchases, chatbots are becoming an increasingly popular sight online. What are some of the different kind of chatbots? Popularised by Facebook Messenger, chatbots are also being used by companies to reach out to users through instant messaging services. This can be in a customer service facility, much like the above example, or alternatively to send push notifications or vouchers to customers that might be in a particular location, or signed up to loyalty schemes. 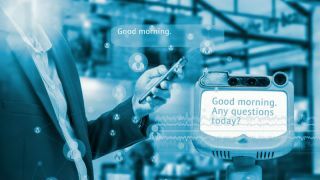 The Internet of Things has also proved to be a valuable use case for chatbots, allowing devices to send alerts or updates whenever they detect something worth noting. How accurate can chatbots be? The accuracy of chatbots very much depends on the company behind the service, and the use case it is addressing. If acting as an online helpdesk, or promotional IM tool, it is highly likely that the service will be linked to an underlying script, and deviating from this may cause the system to crash. The same can be seen in voice-activated services such as Siri or Google Assistant, where the platform is designed to pick up on specific vocal cues or keywords, and respond accordingly. Ultimately the challenge will be whether a chatbot is able to pass the famous Turing Test, and fool a human into thinking they are conversing with a real person. Once this hurdle is overcome, many consumers may begin utilising chatbots more. Can chatbots have a downside? As with any new technology, chatbots have had to overcome a number of issues as part of their evolution process. Several prominent chatbot platforms have suffered issues as part of their development - most notably Tay, one of Microsoft’s early experiments into AI. Tay, a Twitter bot, was designed to be an experiment in “conversational understanding”, but within 24 hours, was targeted with offensive tweets which warped its conception of the world, resulting in a stream of racist and misogynistic replies from the system. Earlier this year, Facebook was also forced to shut down one of its AI chatbot processes after the system started conversing in a language of its own formation, raising fears it had superseded human control. Chatbots have also been used to spam well-known chatroom services with adverts and other harmful content as part of criminal attempts to steal personal details. The likes of Yahoo Live Messenger and Skype have both suffered attacks in the past, with users targeted by spambots.